Tomato and chilli jam is one of my all time favorite fridge staples. I’ve made so many versions over the years I’ve pretty much lost count. The latest has certainly got my attention. This one is made of fresh tomatoes and has the curious addition of star anise giving it a surprising depth and Asian feel. It’s a beautiful bright red , thanks to the fresh tomatoes and is very much a ‘jam’ as opposed to sauce. I use it randomly, it’s just a great little party trick to pull out of the fridge to transform a rather dull lunch or cheese sandwich. In the most extraordinary of circumstances it has even been known to grace our breakfast table to add a little spice to my avocado and egg creations (that’s the food hangover from Istanbul I just can’t kick). I really love it and with the sun shining and bathing my little London world in glorious rays I can’t help dreaming of summer and thinking this is the perfect bbq condiment for 2016 ! Put all the ingredients into a heavy based saucepan and stir. Bring to the boil and simmer for approximately 45 minutes – 1 hour until the jam has thickened and holds its shape. Pour into a sterilised jar, remove the star anise and keep in the fridge. Kale, once beloved by livestock is now top of my list of go to veg at this rather bleak time of year. I’ve been using it with abandon over the last 6 weeks and have come up with some really rather lovely recipe combinations. It ticks the healthy box in spades and is cheap, readily available and very satisfyingly green! I’ve sneaked it into all sorts of dishes, from soups to salads, smoothies to sauces. I prefer it to spinach as it goes a lot further, and though I like chard, I find it more versatile and a little less earthy. The ‘little people have been eating it disguised in pasta, and positively lap it up – oh where would we be without the magic vehicle of pasta? Mr.P has been subjected to my absolute favorite, kale pesto on several occasions, ‘It’s very green darling’ he says nervously. And green it is, but with the subtle addition of garlic, chilli and anchovy and the magic ingredient of walnuts it’s a refreshing change from the normal pesto and a seasonal winner stacked with countless vitamins and other goodies. Put the kale in a bowl and pour a kettle of boiling hot water over the kale – leave for 4 minutes and then drain. Meanwhile splash a tablespoon of oil into a pan and cook the garlic, chilli and anchovy very slowly so the flavours are released but the garlic does not burn. Drain the kale and put in the sauce pan with the garlic, chilli and anchovy. Stir several times and remove from the heat. Put all the ingredients in a liquidizer or a nutribullet with the remaining olive oil and walnuts and whizz until you have a very smooth, velvety sauce. Serve with pasta and lashingsj of Parmesan. The ‘wild wood’ party actually took place a rather humiliatingly long time ago. Back in the dark days of November the ‘blue’one turned the almighty age of 6. It’s such cliche to say it, but where does the time go? I look at the photo taken of him on the day he was born and can’t quite believe we are 6 years down the line, reading, writing, hating maths and wanting to give up school for Lent – genius idea but totally impractical! This birthday we decided to go solo and organize the party ourselves. From the parties I had been to recently, the most fun, most laughter and most enjoyment seemed to be from those where the parents were really actively involved. Mr.P embraced the brief and got ordering, oh the joys of online shopping and I got baking! Walter had decreed a ‘Wild Wood’ party would be the order of the day and a decree went out. It was a pretty nippy November day but nothing to stop some serious camp building, bonfires and bangers. Toasting marshmallows was understandably very popular nothing quite beats ramming a fat one on a long stick and plunging it into the fire; as was alot of running around and stopping the enemy from ambushing the camp. When fingers started cooling down we moved to the archery arena (what could possible go wrong – after all we were only of in the company 16 five to six year olds). Thankfully arrows were kept away from eyes and tea was soon on the menu. I can’t say I have become any more adventurous in this department since when I first started cooking my little peoples birthday party teas. There are without any shadow of doubt some firm favorites, and low and behold the blue one certainly was not going to deviate from them now! Bangers, baby burgers, the age defying hula hoop crisps, a smattering of cucumber and carrots, but basically it was bread and meat, sandwiches and baps! I had deliberately decided on this birthday to make the cake simple. How easy would it be to create a replica of an archery board? Oh simple is not the word. One round cake with 4 different rounds of icing, oh the joy would not be lost on me. No swearing in the kitchen and no hours spent icing some masterpiece. Oops – that plan went out the window when I stupidly double checked the cake choice with said ‘blue’ boy. Huge mistake, massive mistake, monumental mistake. In no time at all he had grabbed my ipad and was scrolling through the ‘Robin Hood’ – ‘Wild wood’ cake creations liberally and callously out for all to see on pininterest and google images. I was clearly in for the high jump! In no time he had selected the cake of his desire and I was left speechless as to how to reincarnate it. After the initial panic subsided I realised I could just about pull it off. The sponge tree trunk I made with 3 x 10 inch sponge cake rounds. I used the Konditer and Cook recipe for chocolate curly wurly cake, as this is deemed in our family to be the best chocolate cake recipe of all time. I sandwiched the trunk together with butter icing and then iced the top, I then covered the whole trunk with fondant icing to create the spreading parts of the trunk and bark. A wonderful fluted piping bag saved my bacon when it came to icing on the bark and a few leaf cutters pulled off the woodland effect. Now clearly the size of everything is slightly out, but you know what, it had the desired effect and the ‘blue’ one adored it. Curiously it was not that difficult to make and just goes to show you don’t know until you try, something I commonly tell my children yet rarely implement myself! I don’t really buy into the Halloween shananigans, at least not in a big way. As a child I have no recollection of ‘trick or treating’ and frankly I’ve got somewhat confused as to what Halloween is all about. That said there is a ‘foodie’ side of this event that I find completely irresistible. People are so creative, you only have to tap in a few key search words and you’re bombarded with an array of wonderful ideas to add to the ‘treat’ box. These are my favorite. So easy to make and totally comical. There are 2 key rules when making meringues- the cleanliness of the mixing bowl – it is so important that this is anything but plastic, copper is ideal but unlikely, aluminium and glass are perfect, and secondly that you cook at a very low temperature – I suggest 110 or ideally the bottom left oven of an aga – the point being to dry the meringues out and extract the moisture – ! Turn the oven on to 110c. 1. Put the egg whites into the extremely clean metal bowl of an electric mixer, something like a kenwood or kitchen aid, or you could use handbeaters, and beat on full power until quadrupled (and more) in size and volume. When you pull the beaters out the peaks of the beaten egg whites should be firm not droopy! This can take 5 minutes or more. If there is any yolk in the egg whites they will not beat up – it has to be 100% egg white! 2. Put the beaters back in and slowly pour in the sugar in 2 stages, keep the beating going at full pelt and after a minute or 2 the meringue will take on a very glossy sheen. Leave the beaters on beating furiously while you prepare the tins. Line a couple of baking tins with baking paper and with a teaspoon or alternatively a piping bag drop / pipe dollops of the mix on to the paper. Place in the oven and leave to dry out for at least 1 hour. I literally do an over sized teaspoon for the ‘little people’ – which is perfect toddler size for pudding. The meringues are ready when they lift easily from the baking paper. 3. Ice on the eyes once the meringues have cooled completely. This recipe can be doubled, tripled to make more. The quantity above is designed for using up left over egg whites – it makes about 15 ‘toddler’ size meringues – or meringue kisses as I call them, or 4 good-sized adult meringues with some extra small ones as well. There’s something very exciting about the change of seasons in England. Autumn is about to ebb into winter and judging by the crisp chilly temperatures of the last few days, maybe there’s even a hint of snow in the air? This time of year naturally brings about a change of what is on the table, instinctively we crave rich, nourishing, comforting and warm food; game, succulent casseroles, slow cooked meats, roasted vegetables and soups. The list goes on and is a direct reflection of what is appropriate given the season, how we feel, what we lust after and what is available. Salad and cold food just doesn’t feature, it feels kind of wrong and rude, who wants salad when it’s 2 degrees outside and the ‘little people’ are breaking ice? That said, I’ve been desperately trying to use up my ‘Shetland Black’ potatoes that are this crazy purple color. Beyond the novelty factor, they are a bit of a challenge and really their only destination is in a salad with salsa verde or something of that ilk. I’ve tried mashing them to see if the ‘little people’ would buy that stupendous purple hue, alas, no, they were not impressed. Just goes to show how color can dictate our palate even if the taste is identical. The ‘blue one’ who is a hard and fast mashed potato fan could not be convinced. Aside from the challenge of using up the ‘Shetland Blacks’, I have fallen in love again with a few seasonal wonders. Drum roll, the ‘cauliflower’! Roasted is my favorite, but I’m pretty partial to puree, it’s certainly one of my top ingredients as I write. Squash, butternut and pumpkin are all popular as well, yet it’s the green stuff that is really top of the pops round here. Cavelero nero and kale are my absolute big loves. Firstly let’s talk about the color – oh boy is it intense? Cavelero nero can almost be purple, so dark is the green, isn’t it odd how Farrow and Ball have not named a color after it, though I guess cabbage named paint is slightly unappealing? Forgetting the color this veg has a history, allegedly it was grown in 600 BC by those canny Italians, thankfully for us, it’s now grown in Lincolnshire and if that’s not enough, it’s packed full of good things; vitamins K, A and C, Lutein, fibre, calcium and is a significant source of the B vitamins to name but a few! This is good stuff. The salad today is raw, roasted and ridiculously good. It’s a real seasonal health booster but is not going to satisfy those with an ‘ I want comfort food’ craving, so pick your moment to eat it. I like it for lunch by itself, though it would work well with partridge or pheasant, guinea fowl and chicken. This is a vegetable salad and can be tarted up or down with the option of crispy pancetta and nuts. The cavelero nero is my nod to the ‘to the food trends of today’, raw, unadulterated, super healthy; the roasted cauliflower is nutty, intense and creamy, quite the best use of cauliflower ever; the avocado sublime and familiar, and the dill-yogurt dressing just marries everything together. It’s easy to make, different, tasty and healthy. Cut the cauliflower into florets and roast in the oven with good slug of olive oil, a sprinkle of Maldon sea salt and some freshly ground black pepper. Roast at 180 for 30 minutes. Turn occasionally and remove once it has a little color and is cooked all the way through. Peel the avocado and cut into slithers. Juice the lime and smother over the avocado. Pick off 2 handfuls of dill fronds. 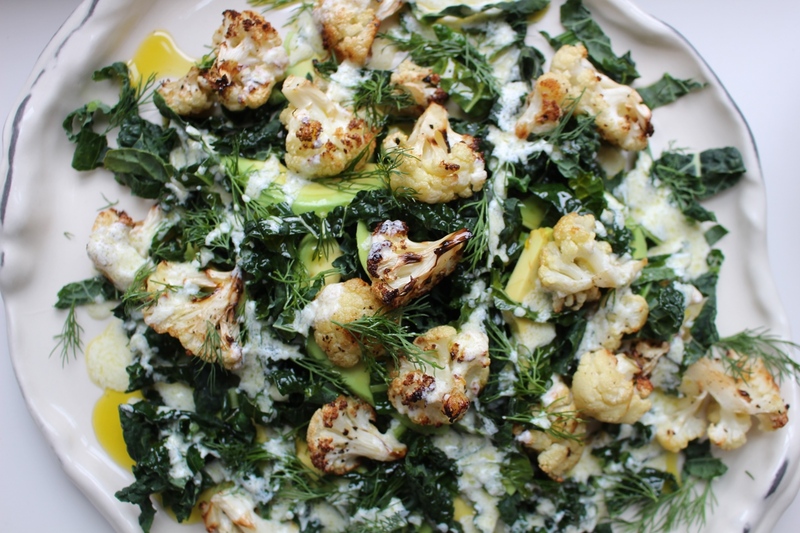 Mix the finely cut cavelero nero, roasted cauliflower, avocado and dill. Dress with a little olive oil and salt and pepper. Whisk the olive oil very slowly into the yogurt, add the lemon juice and maple syrup, salt and pepper. It should emulsify and look like a loose mayonaise, add more water to loosen it if it is too thick. Adjust the seasoning, maybe a little more lemon, salt and pepper and spoon gently over the salad before serving. Optional extras crispy pancetta and roasted hazelnuts. 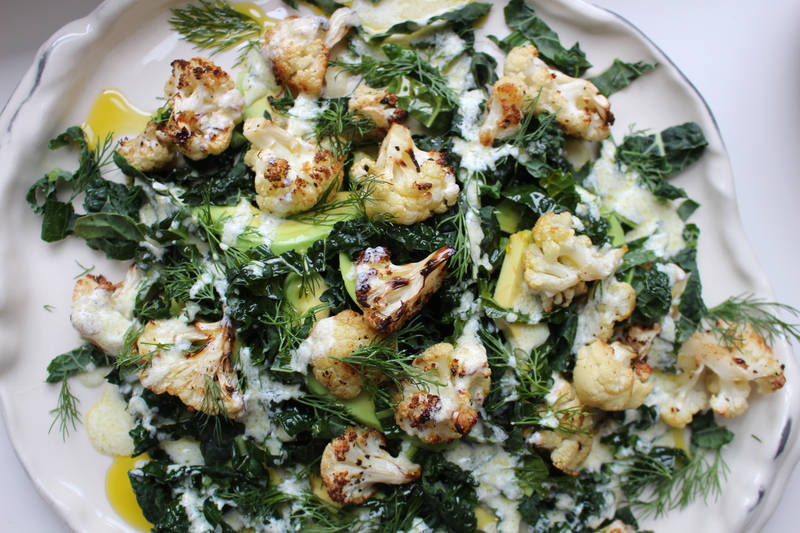 This salad can be served when the cauliflower is still warm or when it is completely cold. if you want to tart it up, it works really well with some crispy pancetta and roasted hazelnuts. I can just get away with writing this post, the sun is out, autumn is here, and the blackberries are still on the brambles – just. Foraging for food has recently become pretty trendy but I remember blackberry picking from years ago. The event itself always seemed to herald the end of summer and natures consolation prize were these purple gems. There’s something very satisfactory about harvesting ‘free’ food and the ‘little people’ have certainly caught onto the idea. So blackberry picking we have been doing and anything that makes it home, usually a rather measly amount, has been turned into ice cream before those pudgy little fingers dive in again! I adore ice cream and with my new fancy ‘ice cream maker’ we have been experimenting in a major way. So far I have made all sorts, and aside from the blackberry, the most memorable being, the naughtiest, most intense chocolate I have ever had the pleasure to eat – thanks to the wonderful ‘Van Leeuwen Artisan Ice Cream’ recipe book. Chocolate I can talk about any time, but blackberry definitely has a season so here is the recipe for any die-hard blackberry foraging ice cream fans! 1.Heat the cream and milk and 2 tablespoons of the sugar in a large sauce pan. Just when it is coming up to the boil take it straight off. 2.Whisk the remaining sugar and egg yolks together and very slowly add in the hot cream and milk mix, whisking all the time. 3.Put the custard back on to the heat and stir until the custard thickens. Watch it like a hawk as you don’t want scrambled eggs! Remove the custard when it has thickened enough to coat the back of a spoon. Leave to cool. 4.Meanwhile make the blackberry puree by blending the fruit and passing through a sieve. Sorry, no fast way around this! 5.When the custard has cooled add the sour cream and blackberry puree and stir well together. Leave in the fridge for at least 2 hours. 6.Now pour into your ice cream machine and churn until it resembles a soft scoop. Remove and pop in the freezer or eat immediately! I have just been given a new ‘Cuisineart Gelato and Ice Cream Professional Maker’ and it is amazing. No freezing bowls in the freezer, it has a built-in freezer and can make up to 1.5 litres of ice cream at any one time – that’s quite a lot of ice cream, I’d highly recommend it. This weekend I have ‘plum and early grey tea’ on the menu and another batch of chocolate, if we scrape together more blackberries, they’ll also get churned up! This is my all time favorite concoction of raw, crunchy vegetables, seriously fragrant herbs, delicate little shrimps, zesty lime and hot chilli. I have created so many variations of this salad that it almost feels wrong writing a recipe for it. It’s contents are usually dictated as to what’s in my fridge as opposed to anything else, so probably should be called ‘lottery in the larder’ salad? I suppose it is a ‘Thai’ salad though the dressing is distinctly Vietnamese, frankly I’m not sure either country would lay claim to it but for my naive Western palette it really hits the spot. I made it earlier this week for a sneaky mummy lunch and have been asked several times for the recipe, so here goes. Don’t feel too tied to it – you can certainly go a little off piste (within reason)! Red chilli – sliced very finely – quantity is up to you. I used one of my own home grown ones which was extremely feisty. They do vary in heat so do test before it goes in. Place all the vegetables, herbs, sesame seeds, chilli and shrimps in a large bowl, toss together lightly. Mix all the dressing ingredients together, add more lime if you need it or a little more sugar depending on your desired taste. Add the dressing, toss again. Place in a serving dish and consume fast!